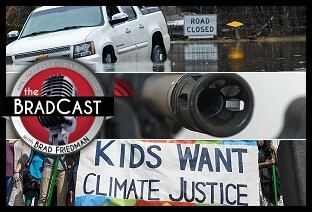 " Under Water, Under the Gun, Under Pressure: 'BradCast' 3/19/2019	"
« PREVIOUS STORY "'Green News Report' - March 19, 2019"
"Under Water, Under the Gun, Under Pressure: 'BradCast' 3/19/2019"
I think 99% of people who say they hate daylight saving time just hate having the clocks change, not having the sun stay up longer. Built,tested and turned out 400 laser ceilometers. Too Many airport weather systems to count, repaired 100's police radar, breath analyzers, tuned radios, concatenated digital voices for pilots,..
Facts make science work, what obfuscates the facts in congress? The white house?